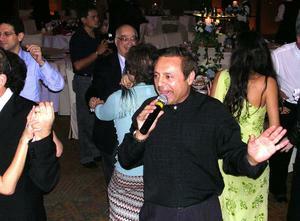 Yosi Levy singing on the dance floor. The L.A based international band The Sabras, with lead singer Yosi Saffi Levy, play as many as 15 languages and many styles of music, from romance and flamenco to Rock`N`Roll. The Band perform songs of Julio Iglesias, Gypsy King, Alabina and Amir Diab, as well as Greek, French, Moroccan, Persian and middle eastern music. The Sabras Band will have at least one song for every guest, making everybody feel important, exited and most important: feel like dancing..
Ose Shalom-a popular Israeli tune.